Nabeel Qureshi was an 18 year old American Muslim when the terrorist attacks of Sept. 11, 2001 occurred. In the wake of the events of that terrible day, he was shocked that fellow Muslims had decided to use their faith (which he had always heard referred to as "a religion of peace") as justification for their actions. He was also dismayed at the very real prospect of his friends or family becoming victims of vigilante attacks. In the book Answering Jihad, he looks at the roots of Islam and how a small minority of Muslims use events portrayed in the Quran to justify jihad. He also answers many questions that people have asked him relating to the issue, as well as proposing a response. In his research into the roots of Islam, Qureshi discovered that the origins of the "religion of peace" statements only go back to the 1930s. His further research into the roots of the religion and the life of Muhammad show that on the contrary, violence was always present. His exploration of the term jihad also uncovers the difficulty of establishing one accepted meaning, but he does agree that it refers to "military action" to spread or defend Islam. From its written origins, sections on jihad immediately followed sections on the Five Pillars of Islam, which detail the rules all Muslims must follow. This gave credence to the notion that violent action in the name of the religion was called for by followers. Qureshi himself sees only three avenues when one begins to study the origins of Islam: apostasy, apathy or radicalization. He himself eventually rejected the violent foundations of Islam and converted to Christianity. While he acknowledges that those who interpret the Quran and its call for jihad literally are a small minority of Muslims, he does not deny that those who choose violence in the name of religion will continue to try to recruit others to their cause. He calls for everyone to work together to interact with each other in understanding and friendship, and not to give in to fear or suspicion. While pockets of radicals may continue to exist, focusing on our mutual desire for peace and friendship will eventually overcome those who cling unquestionably to a violent past. 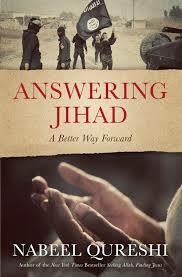 The book also contains several helpful appendices in the back, including a timeline of jihad and a glossary.